On Demand Machinery installs Vortec Thread Guard™ needle coolers in the Super Sewer™ and new XXL model maximizing performance in producing sewn book blocks. Super Sewer™ XXL is the next generation of ODM automatic side sewing machines that’s designed for on-demand photo books, children’s books, yearbooks and text books. The XXL is designed to produce sewn book blocks up to one inch (25 mm) thick. 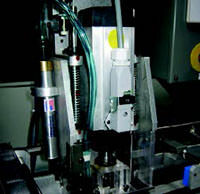 In order to accomplish this and keep book production performance levels at a profitable rate for the bindery department, ODM engineers installed two Vortec Thread Guard™ needle coolers. 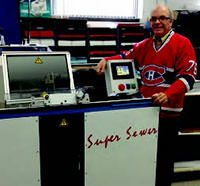 One is installed in the Super Sewer™ XXL’s high speed drill station for pre-drilling holes (up to one inch deep) and the other for thread sewing (same as the original Super Sewer™) in order to maximize performance in producing one-inch sewn book blocks at the rate of 400 per hour. Both Super Sewer™ models feature ODM’s exclusive Back Tach Technology™ simply put, the sewing machine does a reverse back stitch on the head and foot of the book block. This ensures a strong side sew which will not come apart at the head and foot like standard side sewn books. A hopper delivery neatly stacks the sewn books. “Business alliances are more than ever essential. At Quadriscan Group, we understand that success depends on competence and such competence is more effective when several people work as a team. That’s why we inserted the word GROUP in our company name and partnered with On Demand Machinery. Our objective is to bring a maximum of trade masters under one roof. DeMaestria! It spells Better Service for You.” Pierre Larochelle, Quadriscan Group.